While at Grandbury’s latest checkup, we met some great pet parents. One gentleman was greatly stressed about getting his cat into the carrier. 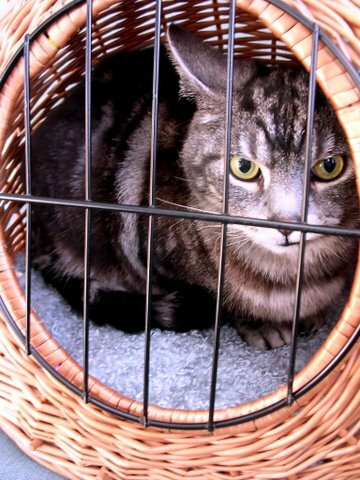 Ernie, his sweet cat, was calmly sitting in the carrier as we all sat in the waiting area, but this wasn’t the case when it came time to prepare Ernie for the trip to the vet. This man has another cat that is much larger and much more vocal about his unhappiness about his carrier and travel in the car. We passed along the following in the hopes that Ernie will have a better go of it when he is ready to hit the road again! The Big Bad Carrier – Think about it, if the only time you ever saw that big plastic box or bag with mesh “windows” was when you got a shot or experienced a surgical procedure, you’d have a hard time running to hop into it too. If you want your cat to be comfortable with his carrier, you need to desensitize him to it. Here are a few tips to help you and your cat. Leave the carrier out among the living – Get the carrier out of the closet and put it down on the floor where your cat can become more acquainted with it. Leave the door open (or remove it totally), put a favorite toy or blanket inside, and just let your cat discover the carrier in his own time. Place the carrier near a favorite lounge spot. If you happen to discover your cat inside the carrier, give him his favorite reward- a treat, a pat, or a sweet word of praise. Don’t linger long enough to make him want to leave the carrier, just praise him and be on your way. Repeat as often as necessary. Keep this up and the carrier may actually become the favorite nap spot. Food is great motivation – Your cat has a favorite snack. Winni is crazy about asparagus, chickpeas, and pasta noodles. I know, she is a little foodie. If your cat just won’t warm up to his carrier, why not try a little coaxing instead of force? While the image of a cat howling and gripping onto the edges of their carrier as the owner attempts to force the cat into a pet carrier may elicit laughs in a cartoon, it is anything but funny if you are the scared cat or frustrated owner (like the ones in the video above). When you are frustrated and rushed, your cat gets frustrated too. Trying to force your cat into his carrier can result in physical injury to you or the cat. When you are ready to leave and need the cat in his carrier, try the following: While letting your cat see you prepare it for transport, put the open carrier on the floor and line it with a soft blanket/towel. As you prepare your cat’s favorite treat, make sure he is within eye sight and can watch what you do with that yummy treat. Place the treat on a little paper plate or paper towel, and then call your pet over to the carrier (hopefully they just follow you and the yummy) and place the treat inside the carrier at the back. Walk away. You’ll be tempted to hover, but you’ll get better results if you just ignore the cat for a minute and let him enter the carrier and go in search of the treat. Once your cat has entered the carrier, gently close it up and let him finish the treat. Now you two are ready to travel. Make it Fun – From the cat’s perspective, the idea of leaving the house just isn’t an optimal choice. Aside from the whole carrier issue, there may be a little more behind the refusal to hit the road. If the only time that your cat ever encounters a car is when he is headed to the vet, you must understand his apprehension. The car and the carrier now represent an unpleasant precursor to a visit at the “not fun place” where one has left body parts and dignity behind. Additionally, between the stress of being chased around the house and pushed into a carrier and the actual movement of the car, there may be a real issue of car sickness behind your pet’s hatred of all things related to leaving the home. If you can limit the stress before going on the ride, and increase the rides that you take with your cat, you may just make car rides a fun event for you and your cat. Take your cat with you when you run that quick errand to return a library book or pick up a pizza. Most importantly, take them when you are not stressed or in a hurry to do anything. You may even need to start with a simple ride around the block. If your cat continually has car sickness, talk with your vet to determine what might be the cause. Clean – Cats don’t want to ride in a yucky carrier. Size Appropriate – The carrier you purchased for the little kitten might be too small for the big adult cat. Safe and Ventilated – Is there a piece of metal or plastic sticking out ready to poke kitty in the eye or bum? Is there adequate ventilation? You never know when you’ll need your cat beside you as a co-pilot. Working with your cat to make him more comfortable and safe when he travels takes time and patience for both of you. Take a breath and take your time. Try as we might, sometimes we aren’t able to decode the unhappiness that is associated with certain items or elements of our pets’ lives. Sometimes we adopt an animal that has issues so deeply ingrained that it will take many years and more treats and tips to change those habits and feelings. Don’t be discouraged if you can’t fix all of your pets’ issues right away; the greatest minds of science still don’t understand the necessity of sleep. This video highlights how differently individual cats can view their cat carrier. There are lots of carriers on the market, see the links below to get you started. How does your cat feel about his carrier? Have a tip you’d like to share?